In April 2017, Dr. Melissa Leber, who is an Assistant Professor and Director of Emergency Department Sports Medicine at Mount Sinai Hospital in New York, presented a series of Orthopedic and Sports Medicine talks at the UF Jacksonville EM Residency Grand Rounds. 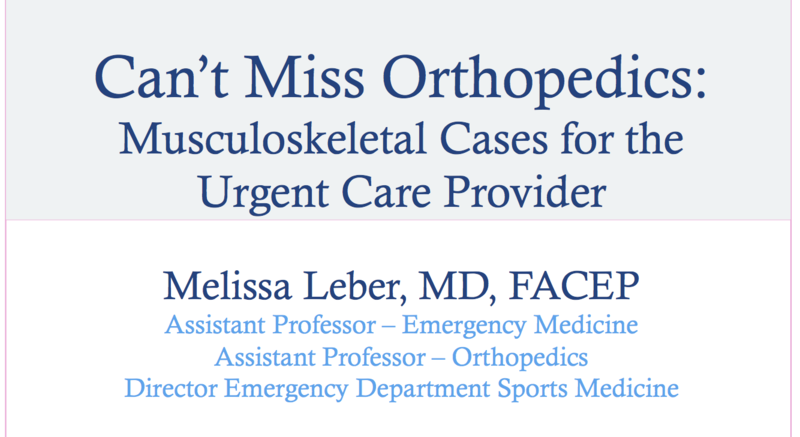 Below is the first part in this series which is entitled “Can’t Miss Orthopedics: Musculoskeletal Cases for the Urgent Care Provider.” Stay tuned for Part 2! Bonus: Check out this great series of musculoskeletal exam videos from ACEP!